Coastal vegetated ecosystems have long benefited coastal communities and fisheries, and in recent years have been recognized internationally for their significant capacity to sequester and store carbon (“blue carbon”)—at rates that surpass those of tropical forests. Yet these ecosystems are being converted rapidly. Current annual mangrove deforestation has been estimated to emit 240 million tons of carbon dioxide. For this reason, financing mechanisms to pay those tropical countries that have significant blue carbon resources to reduce greenhouse gas emissions from deforestation have been explored as a means to fund mangrove conservation. 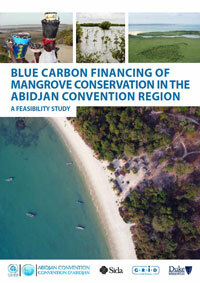 This report by the United Nations Environment Programme, the Abidjan Convention Secretariat, and GRID-Arendal explores the potential of international carbon finance mechanisms to help fund mangrove conservation along the coast of West, Central, and Southern Africa that is covered by the Abidjan Convention and examines the scale of economic benefits that this conservation might provide for the region, including benefits not always recognized in traditional assessments or valuations. 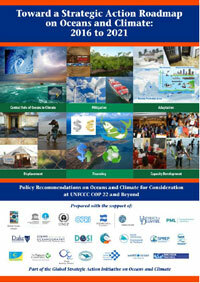 This comprehensive set of policy recommendations on oceans and climate for consideration at the United Nations Framework Convention on Climate Change 22nd Conference of the Parties and beyond is aimed at recognizing the central role of oceans in climate and the need to implement stringent reductions in greenhouse gas emissions to avoid disastrous consequences for coastal and island communities, marine ecosystems, and ocean chemistry. The recommendations from the International Expert Working Group on Oceans and Climate address mitigation, adaptation, displacement, financing, and capacity development. Coastal wetlands conservation and restoration efforts aim to preserve biodiversity and generate benefits to local communities. A diverse portfolio of financing sources has been used for these efforts, including philanthropy, multi- and bilateral aid, in-country governmental funding, tourism-related and other usage fees, and fees and levies associated with wetlands-centric extractive industries. More recently, recognition of coastal wetlands as carbon sinks has opened the door for wetland managers to explore funding sources directed toward climate change mitigation. But finding appropriate funding sources to set up a coastal wetland carbon project or to develop a national carbon program (which includes or is solely focused on coastal wetlands) is often a challenge. 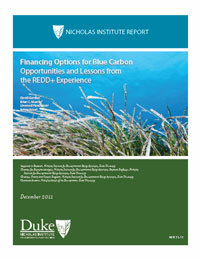 Additionally, carbon finance alone often cannot support the necessary management activities. This report updates Keep It Fresh or Salty: An Introductory Guide to Financing Wetland Carbon Projects and Programs (2014). It uses revised guidance for program and project developers (governments, NGOs, local communities) and extends analysis to other finance avenues that can link and complement carbon activities with non-carbon-based financing sources such as debt-for-nature swaps. Rather than recommending one mechanism over any other, it encourages users to think holistically about the range of benefits provided by coastal wetlands conservation for climate mitigation and adaptation in order to optimize the full range of financial mechanisms. Mangroves provide multiple ecosystem services such as blue carbon sequestration, storm protection, and unique habitat for species. Despite these services, mangroves are being lost at rapid rates around the world. Using the best available biophysical and socio-economic data, the authors present the first rigorous large-scale evaluation of the effectiveness of protected areas at conserving mangroves and reducing blue carbon emissions in the journal Ecological Economics. 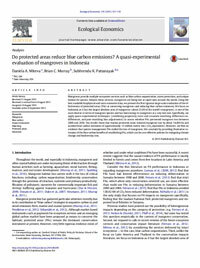 The analysis examines the success of protected areas in Indonesia between 2000 and 2010, finding that their use has avoided the loss of 14,000 hectares of mangrove habitat and approximately 13 million metric tons (carbon dioxide equivelent) of blue carbon emissions. Coastal and marine ecosystems store large amounts of carbon in soil sediments and vegetation. When these systems are disturbed through conversion or degradation, this emits carbon dioxide, a greenhouse gas whose growing atmospheric concentration is altering the climate system. Attention to this source of “blue carbon” emissions has only, fairly recently, been motivated by new scientific studies quantifying its magnitude. The United Nations Framework Convention on Climate Change (UNFCCC), as part of its mission to reduce threats to our global climate system, promotes the sustainable management, conservation, and enhancement of sinks and reservoirs of all greenhouse gases, including those in coastal marine ecosystems. 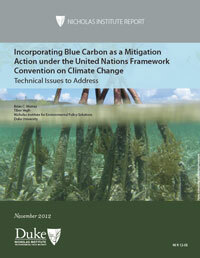 Yet there are no specific mechanisms within the UNFCCC that focus on blue carbon. 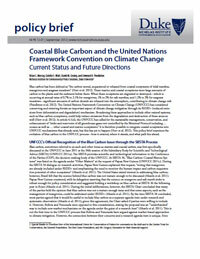 This paper reviews where coastal marine ecosystems and blue carbon may be addressed within existing UNFCCC mechanisms, such as those dealing with land use and reduced emissions from deforestation and degradation (REDD+), at the project and national levels. Recent attention has focused on the high rates of annual carbon sequestration in vegetated coastal ecosystems—marshes, mangroves, and seagrasses—that may be lost with habitat destruction. Relatively unappreciated, however, is that conversion of these coastal ecosystems also impacts very large pools of previously-sequestered carbon. Residing mostly in sediments, this ‘blue carbon’ can be released to the atmosphere when these ecosystems are converted or degraded. Here we provide the first global estimates of this impact and evaluate its economic implications. Combining the best available data on global area, land-use conversion rates, and near-surface carbon stocks in each of the three ecosystems, using an uncertainty-propagation approach, we estimate that 0.15–1.02 billion tons of carbon dioxide are being released annually, several times higher than previous estimates that account only for lost sequestration. Blue carbon has been defined as “the carbon stored, sequestered or released from coastal ecosystems of tidal marshes, mangroves and seagrass meadows.” These marine and coastal ecosystems store large amounts of carbon in the plants and the sediment below them. When these ecosystems are degraded or destroyed, significant amounts of carbon dioxide are released into the atmosphere, contributing to climate change risk. The United Nations Framework Convention on Climate Change (UNFCCC) has considered conserving and restoring forests an important aspect of climate change mitigation through its REDD+ (reduced emissions from deforestation and degradation) mechanism. Broadening these approaches to include other natural systems, such as blue carbon ecosystems, could help reduce emissions from the degradation and destruction of these areas as well. This policy brief examines the evolution of blue carbon in the UNFCCC process—how it entered, where it stands, and what path lies ahead. Many federal statutes and policies specifically require that impacts on ecosystem services be considered in policy implementation. Some federal policies directly include the economic value of certain ecosystem services in estimates of economic impact. Yet, we are unaware of a single federal statute, regulation, or policy that accounts directly for the carbon held in coastal habitats. 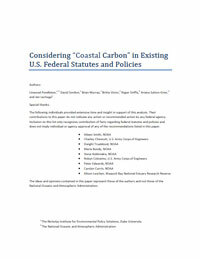 Explicitly accounting for coastal carbon could change the outcome of federal policy actions for variety of federal statutes and policies, including the National Environmental Policy Act, Clean Water Act, and others. These statutes and policies allow for agency discretion in deciding which ecosystem services to include when considering alternative policies, plans, actions, and even assessments of the economic costs of damages to coastal ecosystems. 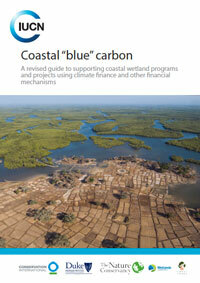 Coastal carbon is an ecosystem service that could be included. When development pressures transform mangroves, seagrass, and coastal wetlands, carbon stored in their biomass and soil is released to the atmosphere as carbon dioxide. One way to counter these pressures and thereby conserve the carbon stored in these habitats (referred to as “blue carbon”) is to provide payments for the environmental services they provide. This paper analyzes current and potential options for carbon mitigation payments as a source of blue carbon finance. With other work that has focused on the payments needed to secure blue carbon, this paper can help stakeholders assess funding gaps and direct scarce resources to those activities that will provide the greatest blue carbon benefits. The natural science of blue carbon is evolving rapidly, and many policy makers remain uncertain about the biophysical potential of these habitats as engines of carbon storage. 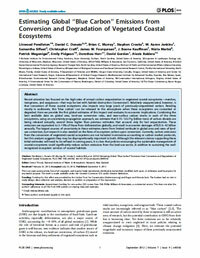 To better manage the ecosystem services provided by coastal blue carbon, we need a good scientific understanding of how coastal habitats sequester and store carbon, where on the planet carbon is stored in these habitats, how rapidly the habitats are being modified with a risk of carbon release into the atmosphere or water column, and the mechanisms and rate of carbon emissions that follow habitat conversion. This report examines the current science as it relates to these topics. 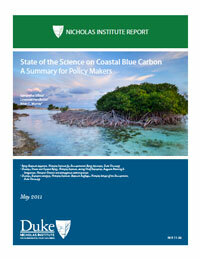 In doing so, it aims to give policy makers a feel for what is known and unknown about coastal blue carbon.